View LeMarchant Place on the Dalhousie Campus Map. &lt;br&gt; Join students Caitlin and Joelle as they see a model three-bedroom suite in LeMarchant Place for the first time. 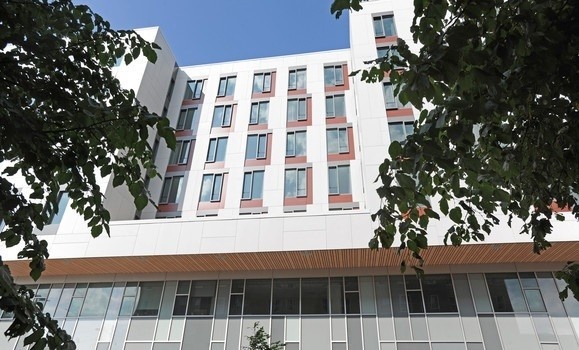 Centrally located on the Studley campus, and within a short walk of the Killam library, the Dalplex, and numerous academic buildings, Dal's newest residence can accommodate 326 students in a mix of fully furnished single rooms (with shared adjoining bathrooms) and two, three and four-bedroom suites. Students with accessibility needs should contact the Residence Office for additional information. Inspections are conducted several times throughout the academic year. You'll get an email to your Dal email account from the Residence Life Team 7 days before the inspections. The date will also be posted on each floor within the residence. advise you on the cleanliness of your suite/shared-bathroom, or any improper health conditions, such as the build-up of garbage and/or recycling. provide you with the opportunity to discuss concerns you may have about your bedroom/bathroom/suite. If your cleaning inspection is not satisfactory, we will leave a notice and follow up after 24 hours. We expect that you will have cleaned before our second visit. If not, each of the residents in the suite will be issued a cleanliness fine (see Cleanliness policy in Residence Code of Conduct). All residents share equal responsibility for the cleanliness of common suite areas (for example, living room, bathrooms, kitchenette). Roommate conflicts WILL NOT be considered as justification for cleanliness issues. If you're new to Dal, be sure to apply to residence by June 30 to be guaranteed a room. 24-hour front desk and secure DalCard entry. Featuring a kitchenette, two bathrooms, and four large bedrooms. Featuring a kitchenette, two bathrooms, and three large bedrooms. Featuring a kitchenette, bathroom, and two large bedrooms. All rooms in LeMarchant (including within suites) are private and feature a bed, desk, and wardrobe. Two, three, and four-bedroom suites feature common shared space. Lounges on each floor feature full kitchens and flat-screen TVs. Located on each floor of LeMarchant Place.